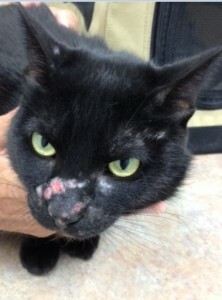 Pictured below is a friendly cat who suffers from a skin condition that primarily affects her face, mouth and pads. It is thought to be an allergic reaction to something in the environment. Her skin becomes itchy and then she scratches her face until it literally bleeds. Study the image and the answer the following question. What is the name of this disease? Eosinophilic granuloma complex is thought to be caused by allergies. The disease affects the face, ears, mouth and pads. 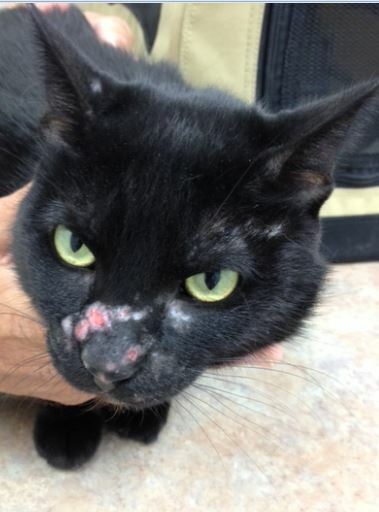 It can cause ulcers as seen in this cat as well as plaques (thickened areas of skin) and granulomas (a lump of inflammatory cells). Most of these cats are treated with immunosuppressant doses of steroids to calm down the immune response. At the same time, a search begins to find out what is causing the reaction. Food and fleas are often the culprits. -Brooks, Wendy. Eosinophilic Granuloma Complex. The Pet Health Library. VIN, 2/11/2003 and revised 11/4/2012.